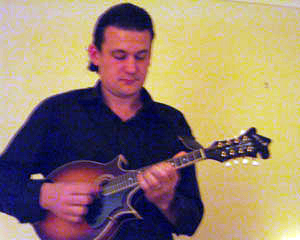 Mandolino is a duo featuring Simon Stewart on mandolin and Christther Shutz on guitar, performing a wide range of Neopolitan and Italian music, both classical and traditional. Naples is arguably the most exotic, lurid and poetic of the cities in what used to be called ‘the grand tour’ centuries ago. Today, it still has the same excitement. Naples is home of the mandolin, and the sound of Italy is conjured up by the duo, Mandolino. The two musicians can play whilst wandering in and out of a crowd or, around the tables, in a restaurant setting. They are suitable for a wide range of performances, from background to outdoor events. Just for good measure, Mandolino throw in a few European and jazz standards for variety. “Just wanted to say that Mandolino were EXCELLENT, and exactly what we wanted. Couple of really nice guys too!